All across the 1800 km-long «vertical line» that separates southern and northern confines of Kazakstan one landscape zone replaces another: forest-and-steppe, steppe, semi-desert and desert ones. In the West the territory of Kazakstan shares its border with the Caspian Sea, in the East it is the Altay taiga that lines the Republic and high peaks of Tien-Shan constitute the border of the country in the South. 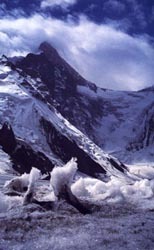 The lowest point the Karaghie depression (132 m below sea-level)- is situated on the Manghystau peninsula while the highest one is Khan Tengri peak in Tien-Shan mountains (about 7,000 m over sea-level). Three major rivers – Yertys, Tobol and Ishim flow into the Arctic Ocean while the rest of the streams either fall into land-locked reservoirs (Caspian and Aral seas, the lake of Balkhash) or just get lost in the vast steppe or desert ranges. It is in fact the main feature of Kazakstan as a geographic region. The second peculiarity consists in a certain asymmetry of landscapes: its western portion (to the West of the 68 E.L. meridian) is almost exclusively plain-like, whereas the eastern one is predominantly mountainous. Apart from such high mountains as Tien-Shan and Altay quite sizable portion of territory is occupied by Tarbagatay, Saur, Kazak low hills, Kokshetau height. In Kazakstan there grow over 6,000 species of plants (of which 535 grow only here) and on its vast space one can come across almost 500 species of birds, animals (178 spcs), reptiles (49 spcs), amphibia (12 spcs), fish (107 spcs). The host of the invertebrate is ever greater: insects only number some 30,000 species. The Usturt plateau situated between the Caspian and Aral seas is a slightly hilly desert-like plain, here and there grown with wormwood and unprepossessing shrubs of Russian thistle. Only in wide-spread drainless depressions there occur shrubs of black saxaul. Steep ledges (chinks) add immensely to the inimitable beauty of the landscape. Particularly picturesque is the Western chink whose height attains 340 m: its eroded precipice would, time and again, take quite fanciful forms. The area is inhabited by such rare animals as Usturt moufflon or urial, ratel from the family of martens, long-needled hedge-hog and a good many species of wild cats: karakal, barkhan cat and the famous cheetah. No small is the number of slim gazelles-zhairans, beautiful bustards (or Jacks) and such other birds of desert. 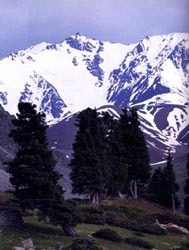 Slopes of Northern Tien-Shan are covered with fir-woods while those of the West are grown with scarce archa trees eventually intermingled with high-grass waterless valleys. Here the gorges are grown with apple-trees and other nut-and-fruit trees. High up in the sky one can see mountainous peaks covered with permafrost snows and glaciers. If you happen to visit taiga-grow mountains of the Altay you might come across a giant of an elik, a handsome Siberian stag, our smallest deer- a musk-deer («kabyrga»), the famous sable and gracefully handsome chipmunk. Only here one can find a wood-grouse, a hazel-grouse, a willow grouse and a ptarmigan. Small wonder that the national authorities have turned the Alpine lake Markakol in South Altay into a special reserve to protect the local flora and fauna. The lake hosts a good many waterfowl whereas its banks and the woods serve a fine nestling place for such rare birds as fishhawk and black stork. As to the Alpine heights they are inhabited by an exceedingly rare bird species – the Altay ular. Steppes of Kazakstan are no second in beauty to other landscape zones. They gain particular fascination because of sweet-and salt-water lakes which attract thousands of waterfowl represented by dozens of species of ducks, geese, gulls, herons, sandpipers, roseate terns. The salt-water lake of Tenghiz situated in Central Kazakstan has been turned into a Kurgaldzhy reserve for it is only here thatpink flamingos make their nests (in fact it is their northernmost colony!). Another, Naurzum steppe reserve is just as rich with various fowl. Apart from a numerous lakes one can admire here a unique pine forest, the southernmost in Kazak steppes. Quite a number of prey-birds have chosen the area for nestling: imperial eagles, falcons (balobans, merlins, common kestrels and others). Deserts too display no small specifics. For the most part they are represented by vast argillaceous plains grown with wormwood and Russian thistle. Along with the aforementioned Usturt, the world-famous Betpak-Dala ranging from the lake of Balkhash to the rivers of Shu and Sarysu adds much to the peculiar fascination of the area. 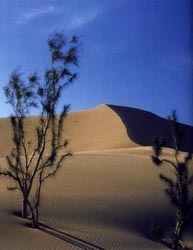 Sand deserts in Kazakstan are represented by such tracts of sand as Kyzylkum (to the West of Syrdaria river), Muyunkum (to the South of Betpak-Dala and Shu river), by sands of South Transbalkhash territory (Sarytaukum, Saryishikatyrau, etc), Transaral Karakum. Most often the barkhans are covered with saxaul, zhuzghun, sand acacia. The area is inhabited by Middle Asian gazelles ousted to the sands by common sheep, many species of jerboas, polecats, piebald poutorak, steppe wiesel and by several species of birds: saxaul jays, steppe hens, larks, desert doves. Yet most characteristic of the desert fauna are, no doubt, reptiles: Middle Asian tortoise, the world largest lizard – grey monitor lizard (its habitat is the desert of Kyzylkum only), steppe agama, several species of geckos, round-headed lizards, small lizards and 17 species of snakes.